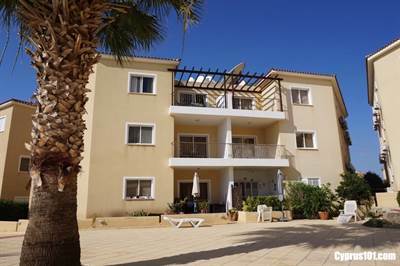 This spacious semi-detached, top floor apartment in kato Paphos has 2 bedrooms and 2 bathrooms is situated on a popular development. Paphos Town and the touristic amenities of Kato Paphos are within a comfortable 30 minute walk and a regular bus service provides easy and quick access to both. The accommodation is spacious throughout and features an open plan living room with comfortable lounge and stylish kitchen/diner. The kitchen with large breakfast bar is well equipped with plenty of fitted cupboards and worktop space. Appliances include built-in oven, electric hob and extractor fan, fridge/freezer, microwave, dishwasher and washing machine. Sliding patio doors from the lounge open on to a good size balcony with pergola above, overlooking the stunning swimming pool and surrounding terrace. Off the living room are two large double bedrooms with fitted wardrobes. The master bedroom has an en-suite shower room and the family size bathroom can be accessed from the passageway to the second bedroom, enabling it to be utilised as an en-suite to bedroom two and/or a separate guest WC. A centrally located car park is available for owners and residents and there is further on-street parking to the rear of the development. This apartment in Kato Paphos is ideal as a holiday home and/or rental investment. It comes fully furnished and ready to move in. There are full title deeds. Next → Next post: Kamares Villa, Paphos – Improved Price!